The E.W. 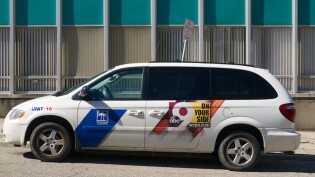 Scripps–operated WCPO.com is moving in on Cincinnati.com’s turf, though both outlets ultimately see the competition as driving richer, deeper journalism for the city and the greater Cincinnati region. By Shan Wang @shansquared Aug. 27, 2015, 10:07 a.m. In Cincinnati, all eyes — or, at the very least, the eyes of those in the local news broadcasting business — have been on WCPO, an E.W. Scripps-owned ABC affiliate television station that in January 2014 put up a hard paywall on its website WCPO.com. It is, at least according to Scripps, the first TV broadcaster in the U.S. to charge for some of its separate online reporting, and while many are trying to guess at the model’s success and whether it will be exported to other markets, Scripps hasn’t released numbers on signups. Scripps’ chief digital officer Adam Symson has argued many times that there’s been an uptick in the quality and breadth of news coverage on WCPO.com, which he says in turn translates into better broadcast coverage. While the company isn’t releasing subscription numbers, Symson said they’ve met internal revenue goals. And the city’s Gannett-owned leading daily, the Cincinnati Enquirer, is certainly feeling the competition. 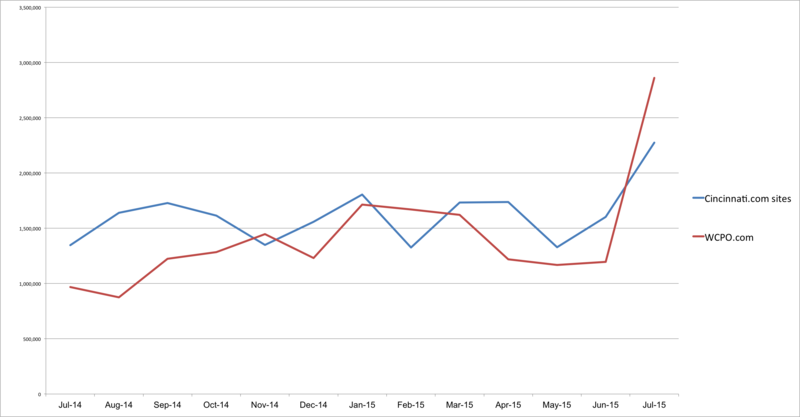 Cincinnati was thrown into the national spotlight after the shooting of Samuel DuBose by University of Cincinnati police officer Ray Tensing last month; the big uptick in traffic for both sites almost certainly represents local news gone national. comScore numbers are widely-cited as the best indicators of any given website’s online audience size, though they aren’t perfect, and often provide much more conservative traffic estimates than internal measures would indicate. Chris Graves, former managing editor for WCPO digital who joined the Enquirer last month as a columnist, says that while she does still consider metrics like traffic stats, she can’t really think of WCPO as a sole competitor anymore. Cincinnati.com operates on a metered paywall, requiring readers to subscribe after 10 free stories a month. WCPO is keeping its more niche and enterprise offerings for subscribers only, while breaking news and weather stories are free to read. Stories on the WCPO website marked with a “+” symbol are available in full to subscribers, but non-subscribers can still read quite a few paragraphs before getting hit with the “Become a WCPO Insider” notice. The same goes for paywalled stories in the WCPO mobile app. As of the writing of this story, the Cincinnati.com paywall wasn’t in effect on its app, allowing access to all of its content for free, but that “will be changed and adjusted going forward,” according to the Enquirer’s senior news director Michael McCarter. At Cincinnati.com, full access comes to $10.83 a month and includes paper delivery, as part of a “back to school sale.” The Enquirer also has its own membership rewards program, Xtras!, serving up similar deals on events and products. To the non-Cincinnati resident, it’s not obvious what’s missing if one doesn’t choose to become a WCPO Insider or an Enquirer subscriber. Both outlets often lead with the same big local news story (“Naked man blamed for chilling seven-car crash” versus “Witness: Fleeing naked man, crash ‘chilling’“) and offer up the usual weather and traffic information that’s critical to local audiences. Both sites have drilled down with longform investigative reporting. Ultimately, the competition will benefit Cincinnati area residents, management at both outlets have said. Scripps and the Enquirer were once intertwined in another way: under a joint operating agreement that published the Scripps-owned Cincinnati Post and Kentucky Post, but the JOA was not renewed after 2007, ending a nearly 30-year partnership. In recent years, Scripps has seriously moved to bulk up its digital offerings. Prior to the WCPO.com paywall’s launch, the company made a big hiring push by bringing on 30 new people, most of whom would focus on digital. It was a hefty up-front investment, and Scripps is still hiring: as of the writing of this story, listings for an entertainment reporter and digital enterprise editor were posted. The company also recently acquired the podcasting and advertising company Midroll Media, another signal of its emphasis on digital. Enquirer editors stressed that they too were looking to experiment “fearlessly and regularly” in digital, while continuing to focus on the paper’s mainstay, which is simply thorough local news reporting. 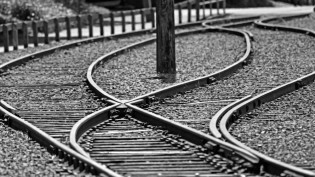 Last year Scripps announced a merger with Journal Communications in which both companies spun off their newspapers under a single umbrella (the Journal Media Group) and merged their broadcast operations, making Scripps into, essentially, a TV company (it now runs 33 television stations in 24 markets). A transformational day for the @EWScrippsCo. Welcome to nearly 1500 new employees across the newly expanded TV and radio footprint. Cincinnati is ranked 36th among U.S. local television markets. WTMJ-TV in that city is also a Scripps-owned station, and Scripps CEO Rich Boehne told the Milwaukee Business Journal last August that the WCPO.com experiment would serve as a template for other Scripps markets, including Milwaukee. But how soon other Scripps-owned stations might actually start adopting the WCPO model, either completely or in part, remains uncertain. A previous version of this article incorrectly stated that Cincinnati.com articles older than a week were behind a paywall. We regret the error. 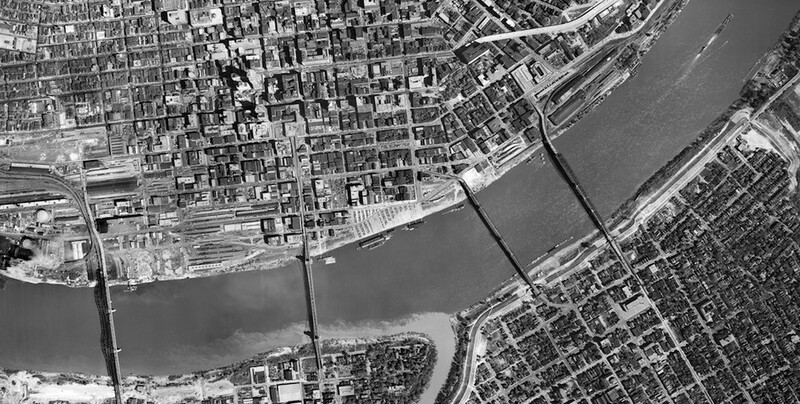 Photo of downtown Cincinnati in 1949 by Michael G Smith used under a Creative Commons license. POSTED Aug. 27, 2015, 10:07 a.m.
Wang, Shan. "A Cincinnati TV station with a paywalled site is challenging the city’s leading daily newspaper." Nieman Journalism Lab. Nieman Foundation for Journalism at Harvard, 27 Aug. 2015. Web. 24 Apr. 2019. Wang, Shan. "A Cincinnati TV station with a paywalled site is challenging the city’s leading daily newspaper." Nieman Journalism Lab. Last modified August 27, 2015. Accessed April 24, 2019. https://www.niemanlab.org/2015/08/a-cincinnati-tv-station-with-a-paywalled-site-is-challenging-the-citys-leading-daily-newspaper/.